For the truck owner requiring cutting edge design and aerodynamics, the TruXedo Edge provides you with all you can handle. Cutting Edge Design Distinct arched tailgate design adds a stylish look that improves the appearance of any truck. Trouble-Free Installation & Use The TruXedo Edge requires no drilling or special tools to install. Mounts to the inside of the truck bed providing stake pocket access for additional truck customization. Quality Leather Grain Fabric The TruXedo Edge fabric is constructed to help protect your cargo from the harshest of elements. Manual Tension Control Easily accessible and adjuster helps your cover to always look its best in all climates. For the truck owner requiring cutting edge design and aerodynamics, Edge provides you with all you can handle. Its arched tailgate design streamlines your truck’s profile creating a very interesting look. Not only that, it goes on quickly with a no-drill installation and the manual tension control feature keeps your cover always looking great. Accessing your bed is simple too, Edge has a one-finger trigger latch that quickly and easily opens the cover. For the truck owner that requires the cutting edge in design and aerodynamics, the Edge provides all you need. In addition to the signature look, TruXedo is known for, the Edge adds the final touch in streamlining your truck’s profile with its arched tailgate design. 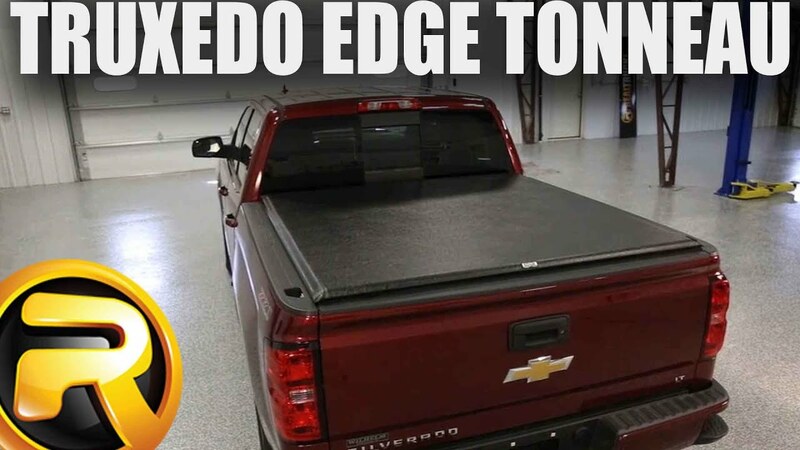 The TruXedo Edge tonneau can be quickly installed on your pickup with no special tools required. The clamp on design allows for easy installation. Each product comes with easy to understand vehicle specific installation instructions.